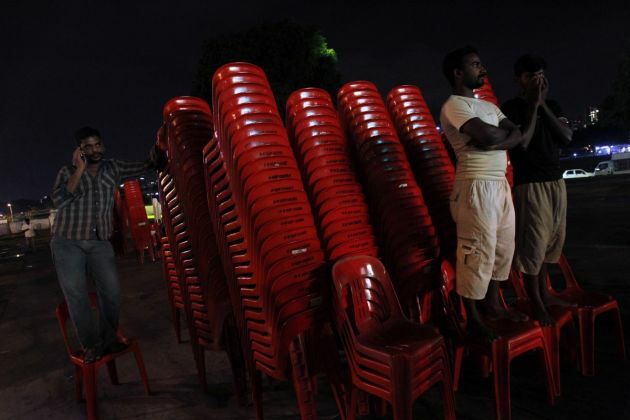 (Photo: REUTERS / Edgar Su)Migrant workers stand on stacks of plastic chairs as they watch a concert ahead of Deepavali at Little India in Singapore October 31, 2013. The Hindu community celebrated the Festival of Lights known as Diwali or Deepavali, on November 2. BUSAN, South Korea - Dan Church Aid, a Lutheran group, has a regional Migrants' Program located in South and Southeast Asia and it has raised the issues of migrant workers at a meeting in Busan. Christian Wolff, DCA's regional program officer for migration, located in South Asia and Jørgen Thomsen, regional coordinator for Asia, informed the World Council of Churches about the ACT Alliance's work in this area. During a meeting at the 10 Assembly of the World Council of Churches in Busan they explained how they are striving to bring together organizations to different countries that have high migration numbers. The two representatives of the church aid agency they shared two cases involving women who experienced domestic violence, physically and mentally. Official figures have confirmed there are about 215 million migrants in the world today. Half of these migrant workers are permanently settled as abroad. Undocumented migration is a current issue, and it is a widespread phenomenon along with the loss of stolen identities. "There was a case with a woman who had migrated from Southern India to work in Saudi Arabia; before she left India, she was told she was to be working as a secretary in a private household. "She was promised $600.00. It was an enormous amount that would have been impossible for her to obtain in India. She had a large family, very poor, and she saw this as an opportunity to take care of her children vneand their educational needs," said Wolff. When the woman arrived in Saudi Arabia, she was taken to her employer's house, and was immediately told to take care of their children and do duties around the house. The woman was confused, and she thought there was a misunderstanding over her role. "She tried to talk and reason with her employer, explaining she was hired to do secretary work. Instead of explaining the situation to her, she was beaten. "This went on for a while; she was required to work for 18 hours a day, was locked in a small dark room, had a lack of food, and was repeatedly threatened and beaten," said Wolff. Due to the house being in the middle of a desert, it was difficult for the women to get outside help, but she eventually managed to sneak away during the night and call her family in India. "After that, her family contacted our partner in India, which leads to our partner filing a petition with the embassy, as well with the ministry in India," Wolff said. It took about three months of negotiation through Indian Embassy to secure the woman's release from this family as the this family who was in effect holding her captive, abusing her physically and mentally, forcing her to work for very little money, and in a situation she did not agree to work in. "Some women go knowingly into these types of work situations. The rate of abuse is very high, and they are generally not able to break out of abusive situations; it is very difficult for them. "We often try to take the help of our partners and their networks, both in India, and help individuals in the Gulf who try to link them up with the embassy's, in order to get them help," Wolff stated. Thailand and Malaysia, and the Gulf region are the vast area destinations for labor migrants in Asia. "The labor migrants are rather well off in comparison to some of the poorest. Actually, some of these people who work among these areas and conditions go from the poorest villages, and they have no other access to employment," Thomsen said during the meeting. "They accept an offer of a 'middle man' who will cheat them, borrow them, abuse them, and sometimes even take their identity. Many labor migrants chose this option because they must pay off heavy debt." Thomsen also discussed a case that involved a woman who was in debt and needed to repay $550.00. "She managed to repay $550 within the first six months of her employment. She was able to send back an average of $45 per-month to her family. If you calculate this correctly, it is about 30 cents a day, nothing more. "She spent two years working long shifts from the early morning until late at night. She was not given a single day off in the two years that she was there. "Her feet and hands were damaged because they were always emerged in soapy water for the cleaning, dishwashing, and for the things that she did for the family; she was only given one set of clothes to work in, one night dress, and a pair of slippers. "For two long years, she finally returned home with only $6.00 in her pocket; one dollar for each member in her family, and for two years, she never left the apartment," Thomsen stated. DCA and its partners are trying to control and share these situations with others in order to bring together organizations in different countries that are having issues with this problem. The Danishc group started the work in 2007; originally, looking initially at Cambodia, where it had had a country office Violence Case Program. DCA was told there were a lot of issues with domestic workers going abroad. Currently, DCA works in South and Southeast Asia. "We want to harvest the experience from this program, and then I think, at a later stage, we will expand to other regions, but for the time being it is limited to Asia. We are trying our best to find out what this work is about, and how we can meaningfully do it. "Our partners are also involved in International Advocacy, where a lot of issues come up in discussion from Latin America and Africa, who are also facing similar issues within these problems. There is a global forum on migration and development. The problem with the international discussions is that they are government centric," Wolff said. The issue from the lack of awareness and the need for countries dealing with labor migration was discussed. The hope for sensitization was addressed in order for more organizations to be involved with this issue. "Losing their identity once they migrate, is an issue we have to be very sensitive about; this is a big trend," a member of the audience addressed. The Migrants' Rights Program takes a comprehensive approach that addresses issues of migrants in countries of origin, transit, and destination throughout the region. It focuses on strengthening civil society organizations, increasing accountability of governments through lobbying at different levels, "and expanding the notion of citizenship to a discriminated group like migrant workers by enhancing their participation in civil and political processes, in both destination and sending countries," DCA's brochure states.